Science corrupted | Mothers Against Wind Turbines Inc. The following is a response to Jeff Smith’s reported comments at a recent Planning Commission meeting. This information fills in some significant gaps to aid the public’s understanding of wind turbine issues. It’s been reviewed by Richard R. James, INCE, for technical accuracy. Nighttime wind turbine noise is limited to 45 decibels LAeq. 45dB won’t trigger complaints, heated debates or calls for township zoning withdrawal; the elephant in the room is “LAeq.” The “Leq” portion indicates the maximum average noise over time. Numerous blade passes can generate 51-56 dB yet comply with 45 dB LAeq. “A” indicates the frequencies measured; but concerned scientists suspect complaints are generated by the unregulated frequencies “C,” or even lower “G.” House walls may filter 15 dBA, but cannot significantly filter dBC, much less dBG. Turbines generate over 100 dBG which penetrates concrete walls with long wavelengths; you can’t “hear” it, but the World Health Organization identifies low frequency noise inside occupied structures as a cause of adverse health effects. 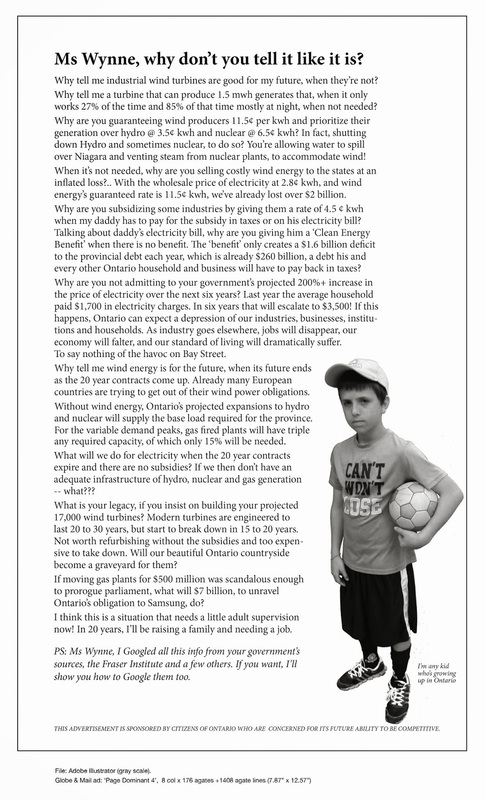 The wind industry will negotiate numbers before letters; the 45 dB LAeq of a 165 ton turbine has been compared to a dishwasher; this half-truth ignores more than it reveals. 45 dB LAeq is a little like requiring cigarettes to come in healthy packaging. Whatever position you take, life’s too short not to love your neighbor as yourself. May God bless Huron County. 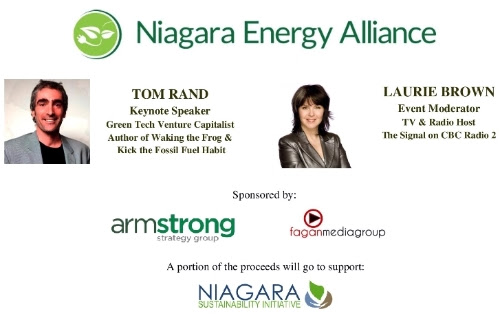 Join us for an Evening with Tom Rand! After a number of years as a successful software entrepreneur Tom now focuses his efforts on carbon mitigation. He’s active in Cleantech venture capital, technology incubation & commercialization, and public advocacy. Tom’s 1st book Kick the Fossil Fuel Habit was published in 2010 and his 2nd Waking the Frog became a bestseller in Spring 2014. It is his belief that we have yet to have a serious, public conversation about the threat of climate change, and the economic opportunities afforded by the global transformation to a low-carbon economy. Take a look at this list as well. Computer models of climate change have been dead wrong, yet alarmists aim to quell debate. I repeat: I’m not a global-warming believer. I’m not a global-warming denier. I’ve long believed that it cannot be good for humanity to be spewing tons of carbon dioxide into the atmosphere. I also believe that those scientists who pretend to know exactly what this will cause in 20, 30, or 50 years are white-coated propagandists. “The debate is settled,” asserted propagandist-in-chief Barack Obama in his latest State of the Union address. “Climate change is a fact.” Really? There is nothing more anti-scientific than the very idea that science is settled, static, impervious to challenge. Take a non-climate example. It was long assumed that mammograms help reduce breast cancer deaths. This fact was so settled that Obamacare requires every insurance plan to offer mammograms (for free, no less). Now we learn from a massive randomized study — 90,000 women followed for 25 years — that mammograms may have no effect on breast-cancer deaths. Indeed, one out of five of of those diagnosed by mammogram receives unnecessary radiation, chemo, or surgery. So much for settledness. And climate is less well understood than breast cancer. If climate science is settled, why do its predictions keep changing? And how is it that the great physicist Freeman Dyson, who did some climate research in the late 1970s, thinks today’s climate-change Cassandras are hopelessly mistaken? Read rest of article here. Will the overselling of climate change lead to a new scientific dark age? That’s the question being posed in the latest issue of an Australian literary journal, Quadrant, by Garth Paltridge, one of the world’s most respected atmospheric scientists. Paltridge was a Chief Research Scientist with the Commonwealth Scientific and Industrial Research Organization (CSIRO). The latter is Australia’s equivalent of the National Science Foundation, our massive Federal Laboratory network, and all the governmental agency science branches rolled into one. Paltridge lays out the well-known uncertainties in climate forecasting. These include our inability to properly simulate clouds that are anything like what we see in the real world, the embarrassing lack of average surface warming now in its 17th year, and the fumbling (and contradictory) attempts to explain it away. TUCSON, Ariz., Aug. 28, 2013 /PRNewswire-USNewswire/ — Climatism or global warming alarmism is the most prominent recent example of science being coopted to serve a political agenda, writes Richard Lindzen of the Massachusetts Institute of Technology in the in the fall 2013 issue of the Journal of American Physicians and Surgeons.